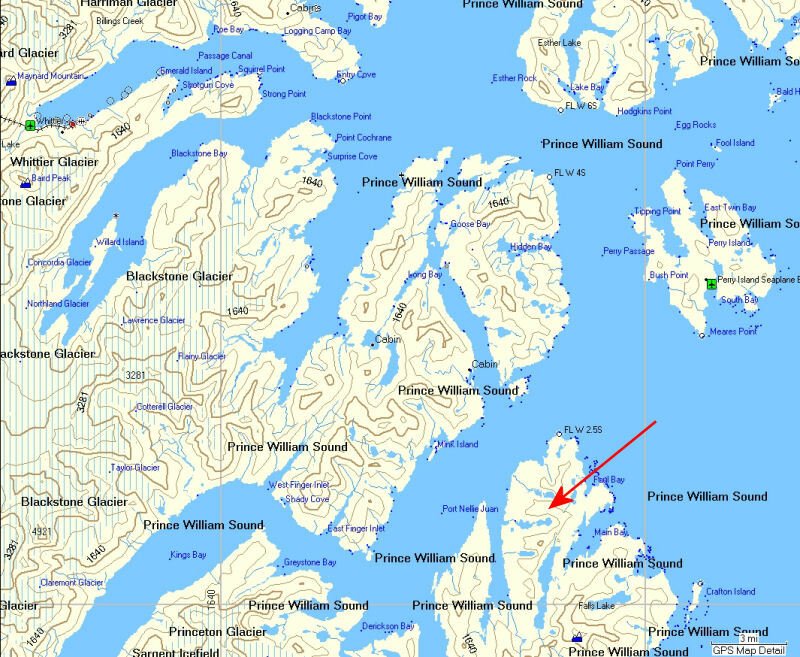 June 13, 2010: For the past couple of years fellow Prince William Sound skier Doug Huvar and I have had eyes on the ridges to the east of McClure Bay. We both tried skiing to the high country in this area last year, but for one reason or another (like weather) it didn't happen. This year Doug got up the long ridge east of McClure Bay this year, with his backcountry skis, a few weeks before my wife and I went. 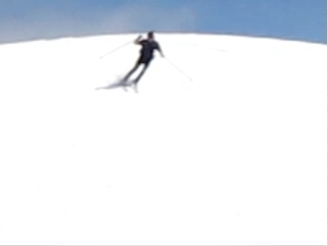 He said the ridge would be good skinny skiing ... and he was right. The above images show the location of the east ridge that leads up from McClure Bay in PWS. Hoofing it up to snowline. Reaching the snow and enjoying the scenic cruise to the top. View from the summit point of the ridge. "Track skiing" with a view. Enjoying the ride back down. Eagles overhead. Lake above the old cannery bay - still frozen. Tracks of a black bear that stepped on our approach ski tracks. Western skunk cabbage. From Wikipedia: "its roots are food for bears, who eat it after hibernating as a laxative or cathartic." Bear Ex-Lax. May 8, 2010: Last year ash fallout from Mount Redoubt hit Hatcher Pass hard. And crust skiing was shut down by a gray blanket of volcanic spew. What a difference there is this year ... good crust skiing is aplenty and the crust surface is really smooth. 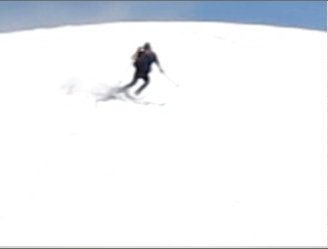 I enjoy crust skiing at Hatchers Pass because there is usually a lot of climbing involved. 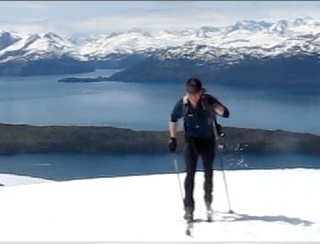 So besides getting some good crust skiing in, you also can get a killer aerobic workout too. 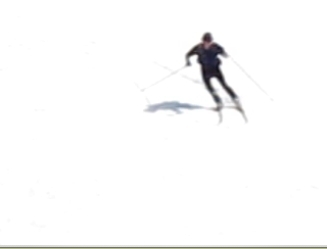 Arrows show areas of good crust skiing terrain. Bald Mountain Ridge in the distance. Nice crust skiing terrain at the head of Upper Willow Creek. Long runs of easy turning ... fun! Heading towards Bald Mountain Ridge. Skiing a "rock garden" north of Bald Mountain Ridge. 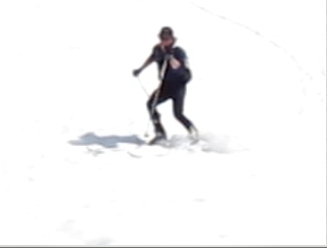 May 4, 2010: Benji, Cory and I skated good crust snow to the back of the South Fork Eagle River valley, crossed Symphony Lake and skied up to the 4000 foot level of a cirque below Triangle Peak. Good turns coming down. On the way back we headed over to Eagle Lake and made some new friends (see the last two pictures of this section). Click here to see Cory's pictures from this ski trip. Climbing up an old glacial moraine. Approaching Symphony Lake. Crossing Symphony Lake and heading towards Triangle Peak. Calliope Peak in the distance. Triangle Peak. Looking, from near the top of our climb, back to where we came from. Reaching the 4000' level in a cirque next to Triangle Peak. Good turns coming down. Benji runs a GS course of avalanche blocks. Heading back to Symphony Lake. Nice crust cruising here. Skirting avalanche run-out debris. Symphony Lake on the way out. Skiing the moraine between Eagle and Symphony Lakes. At the far end of Eagle Lake we noticed fresh tracks in the snow ... and soon Cory spotted the bears. Here are two of the three brown bears that were watching us from the other side of the valley. "OK bears ... it's your valley ... we're outta here!" 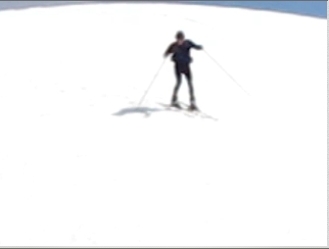 "I'm Going To Be In To Work A Little Bit Late Today ..."
Early May 2010: When it's sunny and there is crust snow above Anchorage ... a two hour ski often takes precedence over showing up at work early. Williwaw Lake A few turns before heading to work.